When the weather in Amsterdam is as beautiful as it has been throughout April and May, there is no stopping the usually sun deprived Dutch from crowding the canals with boats and covering the parks with picnic blankets. 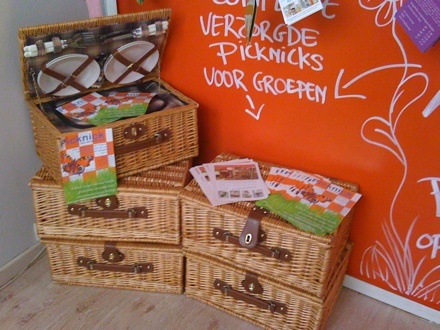 A very convenient way to join in the fun is to pick up a ready-made picnic basket at Casa e Cucina, an organic lunchroom with friendly service and free wifi. Casa e Cucina is located on Koninginneweg, less than 5 minutes walking distance from Vondelpark. The picnic baskets are € 14,95 if you order in advance and contain a tuna salad wrap, pasta salad, a piece of carrot cake, water and orange juice. And I’m sure you’ll be able to organize the missing beer or prosecco from one of the convenience stores on your way! That is a lovely find, I’ll be sure to try it out.